Isuzu adds new clutch boosters and batteries to its after-market parts range. Clutch boosters are designed to reduce the effort required to engage and disengage the clutch continually in high-density traffic. 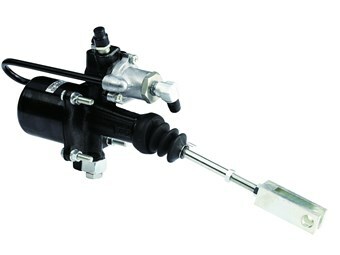 Isuzu has released a new range of clutch boosters for older trucks to complement its best value parts (BVP) range. Clutch boosters are designed to convert the stamp-down force on the clutch pedal into corresponding hydraulic pressure, reducing the effort required to engage and disengage the clutch continually in high-density traffic. "Buying a BVP clutch booster will offer an affordable, quality solution to help reduce driver fatigue," Isuzu says. "Covering a vast range of older truck models, the universal BVP clutch boosters are manufactured to ensure reliability and durability." Isuzu says prices start from $235 and there are five boosters available to suit a wide range of truck models from 1996 to 2009. Also released into the BVP range are three new batteries available in NS70, NS70L and N70ZZ versions, which cover a wide range of Isuzu and other model applications. The BVP range is available through Isuzu dealers and can be fitted by Isuzu technicians. "The current BVP range includes starter motors, alternators, batteries, clutch kits and suspension components, with plans ahead for continued expansion," Isuzu says.